Origami is the art of paper folding. You're probably familiar with the beautiful paper cranes origami can produce, but did you know you can make functional things as well? 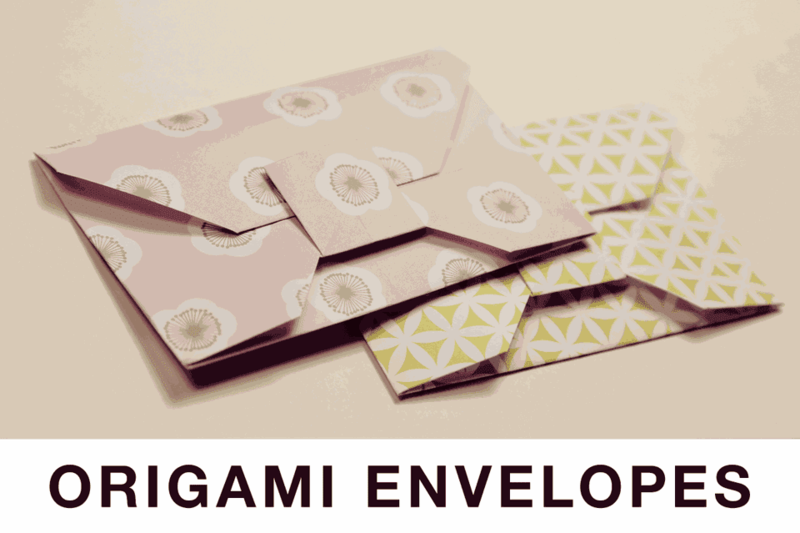 Save some money and give your letters and cards a personal touch by making some stylish origami envelopes. These envelopes are intermediate level but are easy to do once you have the hang of it. They will take about five minutes to make and require only one piece of square paper per envelope, which you can make from a rectangular piece of paper. These pretty envelopes resemble a bow, so you could also attach them to gifts. Use bright and bold colored or pretty patterned paper for the best result. You can find both of the patterns you see in the photo above free to download here. If you start with paper that is 15 by 15 cm, you will get an envelope to fit a card that is up to 10.5 by 6.5 cm. If you start with paper that is 20 by 20 cm, you can fit a card that is up to 13.5 by 8.5 cm. If you're new to origami, maybe start with the Origami Masu Box, it's a great model to start with. Start with your paper white side up, fold the paper in half diagonally both ways. Fold the left and right corners in to meet the center. Bring the top corner to the center and lightly pinch to create a mark. Fold the bottom corner up to meet the mark you just made. Unfold the previous fold and then fold the bottom corner up to the crease you made in the last step. Next, fold the bottom right edge in and align it with the previous crease as shown in image 12. Open out the bottom section. We'll be creating vertical creases where indicated in image 14. Hold the model with one hand and push the right side in to create the creases. You should now be able to fold the lower section up. Unfold the lower section again and fold the bottom corner up as shown and refold. Open out the left side and push in where indicated in image 21. Fold the lower section in half and behind. Now fold the lower section up to the center. Pull out the left and right sides and insert them into the center square. Fold the top corner down to the bottom center and unfold. Fold the top corner to the crease you just made. Finally, ​close the envelope by inserting the top flap under the middle square. Your envelope is now ready to carry a beautiful message to anyone you care about.